What is PAC Tour? 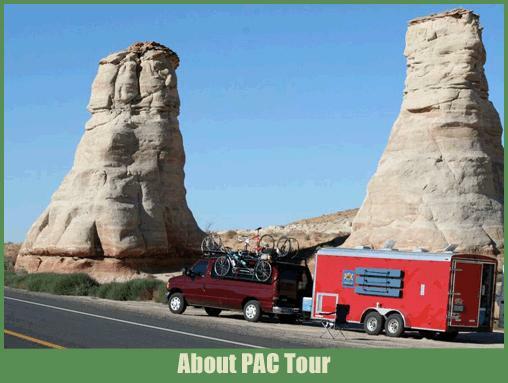 - PAC Tour (Pacific-Atlantic-Cycling Tour) was started in 1985 by cross country record holders Susan Notorangelo and Lon Haldeman to offer long distance cyclists the ultimate cycling vacation. Lon and Susan offer their expertice from over seventy transcons making PAC Tour run smooth. What kind of cyclist rides PAC Tour? - The average PAC Tour rider is 50 years old, though past riders range from 14 to 78 years old. Most have been cycling seriously for at least three years riding over 5,000 miles per year. They are looking for adventure where good cycling is the apex of seeing America on a coast to coast bike ride. What is included in the price of each tour? - Motels, breakfast, lunch, all snackstops, beginning and ending banquets, gear shuttle, technical support, sag service, preparation guidelines, E-newsletter, PAC Tour jersey, T-shirt, large gearbag and support from the most experienced long distance cycling staff in the world. How fast do PAC Tour riders travel? - PAC Tour riders averages 14-18 mph including reststops and sightseeing which means riding down the road at 16-20 mph. Does everyone ride together? - A staggered start each morning encourages riders to ride their own pace and regroup at lunch. Generally, people ride with new friends in small groups of 3-4 riders. What if I have bike trouble? - Two or three vans leapfrog during the day with spare wheels, bikes and equipment. At each motel an experienced mechanic helps with repairs. All riders should carry a few simple tools, be able to change their own flats, and adjust their indexed shifting. Where do we sleep? - Usually a Holiday Inn/Best Western style motel with wifi, a swimming pool, and/or hot tub. Rooms are double occupancy--two beds with 2 riders per room. Single rooms are available at an additional cost. How can I sign up? - Contact us for information or apply online. Make note of the dates, payment schedules and cancellation policy. Return the application with your required deposit. More information will be sent to you as you prepare for PAC Tour. Want to learn more about Lon and Susan? - Lon and Susan have a 5 set DVD collection that covers their successful long distance racing careers. Order this piece of history today! How do we carry our gear? - Each rider receives a gearbag (40-lb.limit) that's carried in the baggage van during the day. Riders should carry a large seatbag for storing raingear and warm clothes. Mesh bags in each vehicle are available to drop off extra clothing throughout the day. When do we eat? - We prepare a buffet breakfast with hot and cold cereals, bagels, muffins, fruit, juice and coffee. At 25-35 mile intervals snacks and drinks are supplied. We provide full lunches near the 70-80 mile mark with a variety of salads, an entree, fruit and dessert. Snacks and recovery drinks await at the motel when you arrive. Dinner is not provided, but we stay near multiple dining options. How fit do I have to be? - Please read the training guidelines, which detail your fitness goals while preparing for PAC Tour. Are partial tours available? - Most trips go point to point across the United States. Often, we will offer one week or several days of a tour. Call for specific opening or details about your partial tour. What kind of bike do I need? - Bestbikeequipment Most ride racing bikes with low gears and reliable wheels. A 39 x 26 low gear is recommended . A triple crankset with lower gears is a good idea. Wheels should be 32-36 spoke clinchers with 23-25mm tires suitable for short sections of gravel and rough pavement. Bring a bike that can be serviced with standard bikeshop tools. We have many spare bike parts to fit basic Shimano/Campagnolo equipped bicycles. Important Notice! PAC Tour was rated by BICYCLING Magazine as "the toughest tour in the world". 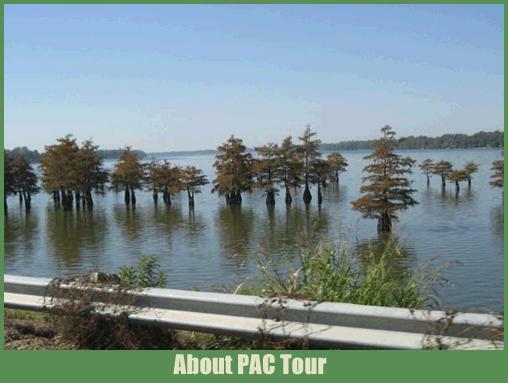 PAC Tour does not follow the flattest, smoothest or easiest route across the country. PAC Tour routes are designed to offer the best cycling routes each day between motels and points of interest. If you are looking for an easy, flat, tail wind tour across America do not sign up for PAC Tour.